Do you want to be better at skateboarding? I mean not just better, but the best of all your friends? The one that everyone at the skate park looks up to? Well you’re not the only one. Thousands of people have tried to become better skaters but most have given up. Why? Because they didn’t have the secrets – the ones that only the best skateboarding teachers and pros possess. Maybe you’re a beginner just trying to learn how to ollie. Or a much more advanced skater trying to master the backside heelflip. Either way, I bet you wish you could learn tricks faster. You’ve probably watched a bunch of skate videos or had your friends help. But let me guess – you’re still not picking up skating as fast as you want to? You’re probably already skeptical that this is the real deal. Lots of our customers were at first too. Before we tell you all about what you’ll learn, just listen to what a couple of your fellow skaters have to say about Secrets of Skateboarding. This is just a sampling of completely unsolicited emails we’ve received over the last year. And this guy is still using the book 2 years later as a refresher for certain tricks! We have a bunch more sample emails like this later, but first, I want to tell you why our teaching methods are so powerful. You see, most friends and tutorial videos are not very helpful in teaching tricks. Friends can only teach you how they do the trick. Every skater is different, so what works for others might not work for you. Trick tip videos don’t help much either. 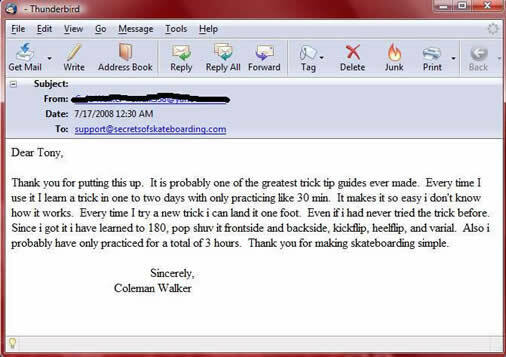 If you search for “skateboard trick tips” in YouTube, you’ll be bombarded with instructional videos that give useless advice such as, “pop up the board, kick it out, catch it, and land.” Great advice. It angers me that people are wasting their time on these instructional videos in slight hope that they will improve. The cold truth is that… They won’t. The main reason why these other methods don’t work is that they don’t help you troubleshoot, or tell you what you’re doing wrong. We’ll actually help you diagnose the problems you are having, which will help you figure out what’s holding you back. Why would following my advice allow you to learn new tricks effortlessly, naturally and instantly? I started skating in 2003, but I certainly didn’t start out thinking I would become one of the most famous skateboarding teachers around. I’m not going to sit here and tell you that I was born with the ability to break down advanced tricks into simple steps that even the most novice skateboarder could pick up. Nope – it took a lot of hard work and trial and error to get to where I am today. When I first started skating, I was intimidated by how much better my friends were then me. Some had been skating for years – how would I keep up? I was frustrated like many of you in the beginning, but I soon made it my #1 goal to figure out what separated the pros from amateurs, and why so many people have trouble learning how to become advanced skaters. 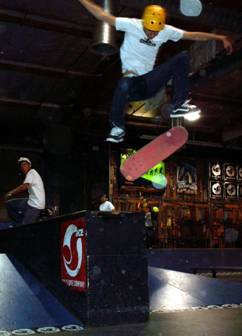 I spent countless hours learned everything I could on both skateboard instruction and accelerated learning techniques honed for many years by gurus of all types of sports and activities. After trying out so many different ways to learn new tricks and grinds, and developing a proprietary system that work much better than anything out there, I quickly realized that I had stumbled onto some pretty powerful stuff. When I finally had a chance to show my friends what I had learned in just a few weeks, my friends were shocked. What took some of my friends years to learn I picked up in weeks. Most importantly, I was more consistent than all of them in landing all of these new tricks. I would beat my friends in S-K-A-T-E with 360 Flips, Backside Flips, and Hardflips, tricks I never thought I’d be doing. It wasn’t before long when my closest skateboard buddies asked me to share with them my secrets for improving so much in such a short period of time. I was very willing to teach them my techniques and they saw huge improvements in their skating. I don’t tell you this to brag, but I just want to help you realize what’s really possible in skateboarding. I started with little and with persistence and the right techniques, gained a huge arsenal of tricks and perfected them in a short amount of time. My point is this: if I could do it, then so can you. It’s true… But you need to have the correct methods to do so. I spent many months crafting my 140 page ebook and 50 pages of bonus materials. There is no fluff. Just killer step-by-step techniques that can take anyone from poser to pro in a couple of weeks. Secrets of Skateboarding is my newstep-by-step master guide I personally follow every time I want to learn a new trick in the shortest amount of time. It contains every single piece of information I discovered in the past year, laid out in a clear and detailed, step-by-step format to guarantee results in the quickest amount of time. There’s nothing but hard hitting, proven techniques that I personally use to build my trick arsenal. This is just a taste of the juicy techniques you’ll find in Secrets of Skateboarding. There’s much more and the best thing about it is that it’s laid out in a simple step-by-step guide that absolutely anyone can follow… even if you’ve never landed a single trick in your life! I’ve been developing this breakthrough underground system for months now without anyone knowing. However before launching this to you I decided to share this guide with some friends and other members of the skateboard community. What’s It Worth For You To Have A Top Underground Skateboarder Reveal The Truth And Hand You A Proven System To Learn Every Single Trick- Quickly! Think about it… With the right information, I was able to take my non-existent skateboarding abilities to whole new levels… Wouldn’t you like to do the same? I’ve done all the hard work for you by spending months testing all the methods and underground secrets and putting it in an easy to follow blueprint that you can easily follow! Add up the time you’ve spent in the past on pointless trick tip videos and how to books. Now you have a genuine chance to follow a proven system that guarantees success. Imagine what it’ll be like to catch tricks impossibly high, land flip and spin tricks with ease, and grind with confidence. Imagine beating everyone at s-k-a-t-e, landing that huge gap, or getting sponsored. Imagine being talked about at your school or skate park as the kid who is incredible mind blowing at skateboarding! What’s it worth to be able to do pretty much whatever you want on your skateboard? This program works…when you follow the step-by-step methods. I have given you the easy directions and show you the way – but only YOU can make it work for yourself. I can easily sell this information for well over $200 considering many skateboard schools and camps offer a couple of lessons for hundreds of dollars. Part one contains the “meat” of the book- the actual trick tips. You will learn step-by-step, detailed instructions and tips for flatground tricks and grinds. Each trick tip clearly explains: proper foot placement, trick to know before trying, weight and balance, proper pop, proper flip and rotation, correct landing, and practicing techniques. The second part contains all my secrets methods and techniques that are outlined, step by step, to improve your skateboarding skills. It is filled with exercises and tips that will guarantee success in a short amount of time. Learn how to choose the right board that suits your style of skating. 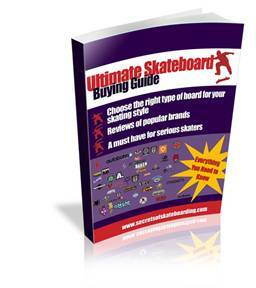 Read about all about the top skateboard products before buying them. Find out about the best (and worst) decks, trucks, wheels, grip tape, hardware, and other accessories. This guide will save you a ton of trouble, time and money! Learning what it takes to produce a good skate video is important- especially if you’re going for that sponsorship. 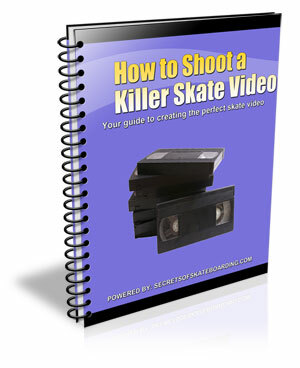 However, even if you just want to make a video with your friends for fun, this guide will guide you through the process and help you shoot a killer skate video. When you start learning more and more tricks, you’ll want to take them to the next level and start skating ramps and rails. 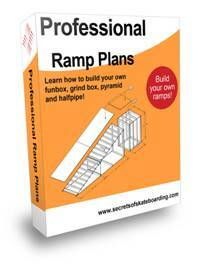 This guide includes ramp building guidelines, hints, techniques as well as blueprints for ramps, rails, pyramids, grind rails and a halfpipe! You’ll have everything you need to build your own skate park at home! 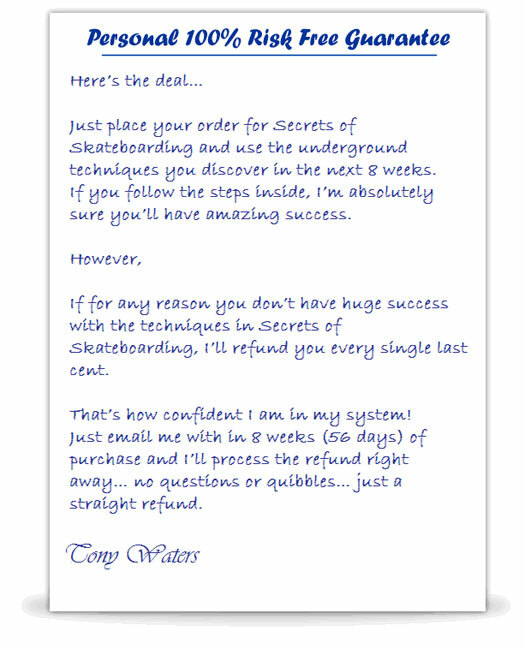 Thanks to the reduced costs involved with doing business on the Internet and my sincere wish to HELP as many people as possible – I have decided to offer you immediate access to Secrets of skateboarding (over 150 pages) for the reduced price of $17! That’s right, for only $17 you’ll be able to uncover the secrets you need to unlock every single trick you’ve dreamed of doing! And the best part is you can get Secrets of Skateboarding delivered instantly online so you can get started immediately! Still Not Convinced? Did I Mention Our 60 Day 100% Money Back Guarantee? Like I said earlier in this letter… I want to help the little guy like you out. Some people would charge you hundreds for this information but I’ve been in your shoes and know how frustrating it can be to learn new tricks. Now I know you’re still maybe thinking that you can’t risk $17 to give this a go… I understand 100%. There’s so much garbage on the web at the moment I have problems trusting people too. 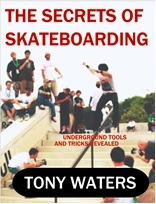 I just finished reading your new ebook, Secrets of Skateboarding. No doubt you are about to help thousands of newbie skaters learn many new tricks. Skaters should forget what they’ve learned in the past and get on board with this new system, which will definitely by huge in the future. Whoever misses it will be very sorry when their friends start using these techniques and they’re wondering why they can’t learn as fast. Tony, Thanks for the Offer, Count Me In! Now there’s nothing to lose but you have everything to gain by downloading this incredible e-book today. 1) Take the risk and grab yourself a copy of Secrets of Skateboarding along with all the bonuses and start the journey towards learning new tricks quick and easier than you have ever imagined. Download Secrets of Skateboarding Now! 2) Leave this page now to only regret it forever. If you are even slightly into skateboarding, you shouldn’t think long and hard about your choice. Now if you ‘Want in’ on these secret skateboarding strategies then just place you order below and you’ll get instant access within a few minutes of ordering. Secrets of Skateboarding is like the skateboarding bible, it is like that “special key” we often search for our whole lives, without success. But Tony has found it; expect to see him go pro any time soon, because this is the best advice you will EVER find. It includes tons of techniques that will make learning tricks 20 times easier and faster, and will give you perfect style too. If every skater knew this information, everyone would be sponsored. PS. You’re getting everything you need to get started on your journey towards skateboarding success… You can finally forget about all the other useless “tips” you’ve been fed and follow a proven system to achieve your skateboarding goals. Download Secrets of Skateboarding Now! PPS. Don’t forget when you download your 140+ page ebook today, you’ll also receive 3 outstanding bonuses valued at $87.There’s nothing to lose as I’m taking all the risk with my personal 100% money back guarantee. PPPS. We sell our products through ClickBank, a trusted online retailer specializing in digitally delivered products that uses the strongest security and anti-fraud features available in the world. In addition to this, they never store any of your financial data in their system. If you have any questions about the safety of the ordering process, visit ClickBank’s website for details: www.clickbank.com. PPPPS. Also… if you have any questions about anything, you can always contact me directly. Thank you so much for revealing your skateboarding secrets. Since reading your book last month, I have already learned 4 new tricks- the backside flip, frontside flip, hard flip and switch heelflip. It was really cool of you to reveal your methods and techniques- they were unquestionably helpful. If I could learn new tricks in under a month, then absolutely anyone can learn new tricks!